In a heavy medium saucepan, combine sweetened condensed milk, chocolate chips and butter. Cook over low heat until the chocolate is melted, stirring often. Remove from heat and stir in vanilla. Cool for 15 minutes. Line a 15 x 10- inch baking pan with parchment paper. With greased hands, press 1 1/2 rolls of cookie dough onto the parchment paper in the pan. Pour cooled chocolate mixture evenly over dough in pan. Crumble remaining dough over top. Bake for 25 to 30 minutes. Cool and cut into squares. 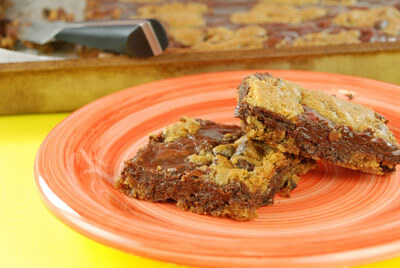 *Note: Sugar cookie or peanut butter cookie dough may also be used in this recipe.